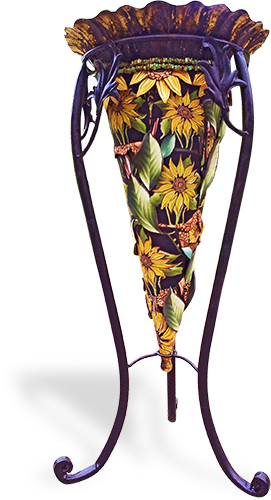 Maine’s Jayne Dwyer took a $5 thrift store plant stand, covered it with her signature polymer canes and turned it into an objet d’art. Every once in a while she moves away from jewelry to larger pieces – tables, wall pieces and other furniture – to stretch her artistic muscles. Jayne’s way of working with canes might appear very loose and free form. The results are quite remarkable, dramatic and very distinctive. You can see her canes on her website and on her Facebook page. Yes! Yes! Yes! This is stunning, as is your website. I’m going to my thrift store with new eyes today. A fabulous piece. Jayne is such a talented person, her canes are magical. I looked at the website to see how she makes her beautiful canes. My question: how in the world does she reduce those massive canes? Kudos. This piece is absolutely stunning. The colours are superb and the cane work sublime. I love It!! Jane is completely obsessed with her canes, but they are truly wonderful! Way to go! Thank You Cynthia, and thanks so much for the lovely comments all! Very inspiring! Love her subtle color varieties that make a big statement! Just what I needed to boost a desire to do another cane. Wow! Really blown away by this artist! I love incorporating polymer into home decor pieces, gives them flair and pizazz! Thanks for sharing this one, really interesting piece. Such amazing cane work, I really love the detail Jayne achieves in her canes, they are simply wonderful.